This article is about the area in London. For the former exhibition centre, see Earl's Court Exhibition Centre. For the Underground station, see Earl's Court tube station. Earl's Court is a district in the Royal Borough of Kensington and Chelsea in central London, bordering the rail tracks of the West London line and District line that separate it from the ancient borough of Fulham to the west, the sub-districts of South Kensington to the east, Chelsea to the south and Kensington to the north. It leant its name to the now defunct eponymous pleasure grounds opened in 1887 followed by the pre-Second world war Earl's Court Exhibition Centre, as one of the country's largest indoor arenas and a popular concert venue, until its controversial closure in 2014. 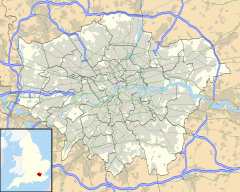 In practice, the notion of Earl's Court, which is geographically confined to the SW5 postal district, tends to apply beyond that boundary to parts of the neighbouring borough of Fulham with its SW6 and W14 postcodes to the west, and to adjacent streets in the Kensington and Chelsea postcodes of SW7, SW10 and W8. A map showing the Earl's Court ward of Kensington Metropolitan Borough as it appeared in 1916. Earl's Court was once a rural area, covered in orchards, green fields and market gardens. The Saxon Thegn Edwin held the lordship of the area prior to the Norman conquest. For over 500 years the land, part of the ancient manor of Kensington, was under the lordship of the de Vere family, the Earls of Oxford, descendants of Aubrey de Vere I, who held the manor of Geoffrey de Montbray, bishop of Coutances, according to the Domesday Book 1086. By circa 1095, his tenure had been converted, and he held Kensington directly from the crown. A church had been constructed there by 1104. The earls held their manorial court where the Old Manor Yard is now, just by Earl's Court tube station, eastern entrance. Earl's Court Farm is visible on Greenwood's map of London dated 1827. The name Earl's Court likely came from the fact that for a long time the owners of the land were an old English noble family, the Rich family and they were the earls of Warwick. When Edward Henry Rich, 9th Baron Rich, 7th Earl of Warwick and 4th Earl of Holland died young in 1721, the assets including the Jacobean Holland House, passed by marriage to the Edwardes family. The original catalyst for development was the ill-fated vanity project by Lord Kensington (died 1852) which consisted of the two-mile conversion of the insanitary Counter's Creek into the Kensington Canal (1826 onwards), followed by its eventual replacement first by "Mr Punch's railway", opened in 1844 and next, by the Metropolitan District Railway in 1865–69, which eventually became London Underground's District Line and was joined after 1907 by the Piccadilly line. Meanwhile, the congestion apparent in London and Middlesex for burials at the start of the century was causing public concern not least on health grounds. In 1837 a decision was made to lay out a new burial ground on the edge of Earl's Court in an outlying area of Brompton. The moving spirit behind the project was the engineer, Stephen Geary. It was necessary to form a company in order to get parliamentary permission to raise capital for the proposal. Securing the land – some 40 acres – from local landowner, Lord Kensington and the Equitable Gas Light Company, as well as raising the money proved an extended challenge. After two years the cemetery was duly established by Act of Parliament and laid out in 1839, it opened in 1840, originally as the West of London and Westminster Cemetery. It was consecrated by Charles James Blomfield, Bishop of London in June 1840, and is now one of Britain's oldest and most distinguished garden cemeteries, served by the adjacent West Brompton station. In the quarter century after 1867, Earl's Court was transformed into a loosely populated Middlesex suburb and in the 1890s a more dense parish with 1,200 houses and two churches. Eardley Crescent and Kempsford Gardens were built between 1867 and 1873, building began in Earl's Court Square and Longridge Road in 1873, in Nevern Place in 1874, in Trebovir Road and Philbeach Gardens in 1876 and Nevern Square in 1880. Earl's Court's only hospital was opened in 1887 on the corner of Old Brompton Road and Finborough Road. It was named in honour of Queen Victoria's youngest daughter. It fell prey to the NHS axe in 1978 when it offered mainly obstetric provision. For most of the century, Earl's Court was home to three notable institutions, all now gone. The first and indeed oldest school of its kind is the London Academy of Music and Dramatic Art founded in 1861. It was located on the corner of Cromwell Road and Earl's Court Road, until its move to the former Royal Ballet School in Talgarth Road. The next foundation dated 1892, was the London Electronics College (formerly the London School of Telegraphy), which was located at 20 Penywern Road and in its heyday did much to expand the use of Morse code throughout the world. Already in the 1990s it was threatened with closure as technology had moved on. It finally closed in 2017 having served as a further education college offering electronic engineering and IT courses. The third institution was the Poetry Society, founded in 1909 and housed at 21 Earl's Court Square. It decamped to new premises in the recently refurbished Covent Garden district of Central London in the 1990s. Evidently, after WWI, Earl's Court had already acquired a slightly louche reputation if George Bernard Shaw is to be believed, see his Pygmalion. Following the Second World War a number of Polish officers, part of the Polish Resettlement Corps, who had fought bravely alongside Allied Forces, but were unable to return to their homeland under Soviet dominance (see Yalta Conference), opened small businesses and settled in the Earl's Court area leading to Earl's Court Road being dubbed the "Polish Corridor". During the late 1960s a large transient population of Australian, New Zealand and white South African travellers began to use Earl's Court as a UK hub and over time it gained the name "Kangaroo Valley". It was at the time one of the cheapest areas close to central London, and until the 1990s remained a somewhat down-at-heel district compared to its more upmarket neighbours to the North and East. The area was, for a long time, the place to buy and sell the ubiquitous VW camper van. This moved off in the direction of the New North Road (near Old Street EC1) in the 1980s. Today, while there are still significant numbers of students or other people on temporary visas, many of the Australians and New Zealanders appear to have moved on to now-cheaper areas further North and West. The name "Kangaroo Valley" lingers on in the usage of older expatriate Australasians and Australasian visitors, as does the alternative nickname "Roo Valley". 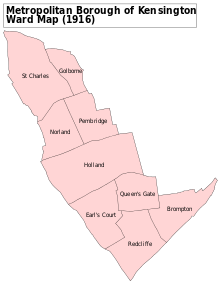 The Earl's Court ward had a population of 9,659 according to the 2001 census. The change in the area's population is largely owed to rocketing property prices and the continued gentrification of the area. The scale of change is illustrated by the economic divide between the eastern and western areas of Earl's Court. Despite fighting fiercely for the exhibition centre, according to Dave Hill in The Guardian, the area's economy has been destroyed by this imbalance and the destruction of the exhibition venue. Edwin Arnold (1832–1904), English poet and journalist, lived at 31 Bolton Gardens. Dame Ellen Terry (1847–1928), leading Shakespearian stage actress in Britain in the 1880s and 1890s, lived at 22 Barkston Gardens. Edmund Allenby, 1st Viscount Allenby (1861–1936), British soldier and administrator famous for his role during the First World War when he led the Egyptian Expeditionary Force in the conquest of Palestine and Syria, lived at 24 Wetherby Gardens. Howard Carter (1874–1939), English archaeologist, Egyptologist and primary discoverer of the tomb of Tutankhamun, lived at 19 Collingham Gardens. Sir William Orpen (1878–1931), Irish portrait painter, lived at 8 South Bolton Gardens. Alfred Hitchcock (1899–1980), English filmmaker and producer, lived at 153 Cromwell Road. Benjamin Britten (1913–1976), English composer, conductor, violist and pianist, lived at 173 Cromwell Road. Hattie Jacques (1922 –1980), an English comedy actress of stage, radio and screen including the Carry On films, lived at 67 Eardley Crescent. In November 1995 a blue plaque was unveiled at this house by Eric Sykes and Clive Dunn, who was a colleague from her Players' Theatre days. Sir Robert Gunter (1831-1905), army officer, confectioner, developer and MP and his Yorkshire ancestry left their stamp on the area not merely as builders of the huge Gunter estate, but by conferring so many West Riding of Yorkshire names throughout Earl's Court, i.e. Barkston, Bramham, Collingham, Wetherby, Knaresborough etc. William Butler Yeats (1865-1939), Irish poet and pillar of the literary establishment, Nobel Prize winner lived at 58 Eardley Crescent during 1887 when he returned to London with is parents. His mother suffered several strokes that year. Horace Donisthorpe (1870–1951), English myrmecologist and coleopterist, lived at 58 Kensington Mansions, Trebovir Road. Memorable for championing the renaming of the genus Lasius after him as Donisthorpea, and for discovering new species of beetles and ants, he is often considered the greatest figure in British myrmecology. Adelaide Hall (1901–1993) American jazz singer and entertainer lived at 1 Collingham Road with her husband Bert Hicks. Diana, Princess of Wales (1961–1997), member of the British Royal Family, was the first wife of Prince Charles, lived at 60 Coleherne Court, Old Brompton Road, from 1979 to 1981. The 3-bedroom flat was bought for her by her parents for £50,000 as an 18th birthday present. Diana, who shared the space with three roommates who paid her £18 per week rent, once said it was where she spent the happiest time of her life. Diana lived there until February 1981 when she moved into Clarence House, the Queen Mother's residence, on the night before her engagement to Prince Charles was officially announced. In the 1990s, Diana regularly returned to the area to work out at Earl's Court Gym (now part of the Soho Gyms chain) next to Earl's Court underground station. Kensington Mansions, on the north side of Trebovir Road, was the mysterious mansion block in Roman Polanski’s movie Repulsion (1965), in which the sexually repressed Carole Ledoux (played by Catherine Deneuve) has a murderous breakdown. The film won the Silver Berlin Bear-Extraordinary Jury Prize at the Berlin Film Festival later the same year. Part of the Italian film Fumo di Londra (internationally released as Smoke Over London and Gray Flannels, 1966) was shot on Redcliff Gardens. Alberto Sordi, who wrote, directed and starred in the film, won the David di Donatello for best actor. The soundtrack by Italian maestro Piero Piccioni is one of his best known. 64 Redcliffe Square is featured in An American Werewolf in London (1981). The film is a horror/comedy about two American tourists in Yorkshire who are attacked by a werewolf that none of the locals admit exists. The flat in the square belongs to Alex (Jenny Agutter), a pretty young nurse who becomes infatuated with one of the two American college students (David Kessler), who is being treated in hospital in London. Earl's Court was the setting for the 1941 novel Hangover Square: A Tale of Darkest Earl's Court by novelist and playwright Patrick Hamilton. Often cited as Hamilton's finest work, it is set in 1939 in the days before war is declared with Germany. The hero George Harvey Bone innocently longs for a beautiful but cruel woman called Netta in the dark smoky pubs of Earl's Court, all the while drowning himself in beer, whisky and gin. 26 Courtfield Gardens was mentioned in Richard Curtis' About Time (2013) and was the location for one of party scenes. Earl's Court may be within walking distance of High Street Kensington, Holland Park, Kensington Gardens/Hyde Park, the Royal Albert Hall, Imperial College, the Natural History, Science and Victoria and Albert Museums. The introduction of two Underground stations, and a mass network of railways trapped a triangle of land on the border of the original parishes of Kensington and Fulham. After an unsuccessful attempt to build a Catholic school on the site, the idea of introducing entertainment to the area was brought to fruition by John Robinson Whitley, an entrepreneur from Leeds who used the land as a show-ground for a few years from 1887. Whitley did not meet with business success, but his aspirations for Earl's Court took hold for others to fulfil. In 1895 the Great Wheel, a huge Ferris wheel, was created for the international impresario, Imre Kiralfy's Empire of India Exhibition. A plaque in the former Earls Court venue commemorated some of these events and that the reclusive Queen Victoria was an occasional visitor to the many shows put on at the site. In 1897 Kiralfy had the Empress Hall built to seat 6,000 in neighbouring Fulham and he had the Earl's Court grounds converted into the style of the 1893 Chicago White City for the Columbian Exposition. More was to come. Not until 1937 was the former Earl's Court Exhibition Centre opened, with its striking Art Moderne façade facing Warwick Road. A new entrance to Earl's Court tube station was constructed to facilitate easy access to the Exhibition Centre, including direct entrance from the underground passage which connects the District and Piccadilly lines. This was however closed in the 1990s at around the time the capacity of the Exhibition Centre was expanded by the construction of a second exhibition hall, Earl's Court 2, which was opened by Princess Diana, herself a former Earl's Court resident. In its heyday the Earl's Court Exhibition Centre hosted many of the leading national trade fairs, including the annual Motor Show (1937-1976) and Royal Smithfield Show, as well as Crufts dog show and the combined forces Royal Tournament, which gave its name to the public house (now demolished) on the corner of Eardley Crescent. The biggest trade fairs migrated to the National Exhibition Centre at Birmingham International Airport when it opened in 1988. The longest-running annual show was the Ideal Home Show in April, which attracted tens of thousands of visitors. Otherwise, it was increasingly used as a live music venue, hosting events such as the farewell concert by the boy-band Take That. At the other end of the scale, it was also used for arena-style opera performances of Carmen and Aida. Archive Movietone newsreel footage (which can be seen on YouTube) captures a unique and powerful rehearsal of the Berlin Philharmonic Orchestra under Wilhelm Furtwängler playing the end of Brahms' Fourth Symphony during a post-war reconciliation visit to London. The venue has now been demolished by its owner Capital & Counties and the latter's expectation that the site along with other adjacent important historic items would be redeveloped by 2020 with a mixture of high-rise residential buildings and a "high street" with retail, is subject to delay for a range of reasons. The net effect has been a steep fall in the economic activity of Earl's Court and extreme depredations to the "green corridor" that bordered West Earl's Court: Philbeach Gardens and Eardley Crescent up to and including West Brompton Station. A sign of Earl's Court's economic decline was the closure in 2016 of its Crown Post Office and sorting office, after well over a century and despite many representations from local amenity groups, businesses and residents. The Prince of Teck is a Grade II listed pub at Earl's Court Road. A striking remnant from a by-gone age in the Earl's Court Road, is a nursery and garden shop backing onto Pembroke square where most of the signs, especially for spring bulbs, are still hand-written and knowledgable staff mingle with the customers. An early 1940s and 50s Bohemian haunt in the Earl's Court Road was the café, el Cubano, which had piped music and an authentic Italian steam coffee machine, a rarity in those days. It was few doors down from the legendary bakery, Beaton's, whose only other outlet was in the The King's Road, Chelsea. The Troubadour is a coffee house and a small music venue, which has hosted emerging talent since 1954 – including Bob Dylan, Jimi Hendrix and Elvis Costello. The Finborough Theatre, which opened in 1980, is the neighbourhood's local theatre. Earl's Court Village is the centre of the British Filipino community, with a number of restaurants, supermarkets (many of which also serve take-away food) and banks. The area is also home to a police box of the type resembling the Doctor's time machine in the BBC television series Doctor Who. The blue police box located outside Earl's Court underground station in Earl's Court Road is actually a modern-day replica of the traditional GPO police signalboxes that were once a common sight in the UK until the early 1970s. Used as a kind of specialised telephone kiosk for policemen on their "beat", the boxes were eventually phased out with the introduction of personal radios in the police force. There were many examples of traditional craftsmanship and the creative industries in the Earl's Court area, such as Fulham Glass-Blowing, a world-famous mannequin factory, also in Hammersmith and Fulham, until moved on by developers as part of Europe's largest "regeneration Scheme". "East Earl's Court" lies to the south of Cromwell Road and to the east of Earl's Court Road (a main north-south artery which bisects Earl's Court) and is home to many multimillion-pound flats and houses in smart garden squares and residential streets. The southern boundary of Earl's Court is Old Brompton Road, with the area to the west being West Brompton, and the area to the south east being the Beach area of Chelsea. Here, (based on sale prices per square foot), the Boltons, has some of the most costly real estate in Europe. Houses in the Boltons have sold for up to £20 million. The eastern boundary of Earl's Court is Collingham Gardens and Collingham Road, east of which is South Kensington. "West Earl's Court", lying to the west of Earl's Court Road, is notably different in architecture. White stucco fronted "boutique" hotels in Trebovir Road and Templeton Place, and the impressive late-Victorian mansion flats and town houses of Earl's Court Square, Nevern Square and Kensington Mansions, contrast with the area’s remaining cheaper hotels and apartment houses full of bedsits (also known as bed-sitters or bed-sitting rooms). Earl's Court preceded Soho and Vauxhall as London's premier centre of gay nightlife, though the number of businesses aimed mostly at gay men has dwindled to a single retail outlet, as Soho and Vauxhall established themselves as the new focus. The first public nightclub aimed at a gay clientele, the Copacabana, opened in Earl's Court Road in the late 1970s, but was re-themed as a general venue in the late 1990s. The bar upstairs, Harpoon Louie's (later Harpo's and later still Banana Max), was until the late 1980s among the most popular gay bars in London. It is now a Wagamama restaurant. The oldest pub on the site was the Lord Ranelagh pub (opposite the former Princess Beatrice Hospital) now demolished, that in 1964 spearheaded the local demand for live entertainment. A young, non-gay, male band, the Downtowners, attracted considerable attention. They persuaded many of the local cross-dressers to come into the pub and perform. Thus, the Queen of the Month contest was born. Every Saturday night the pub was packed to capacity. The show ran from September 1964 until May 1965 when the News of the World ran an article entitled 'This show must not go on'. On that Sunday night the pub was so packed that every table and chair had to be removed. Crowds spilled out on to the pavement onto Old Brompton Road. The police closed the show. Many well-known celebrities were among the clientele and the Lord Ranelagh, in its incarnations as Bromptons and finally, Infinity, is considered to have played a role in the history of gay liberation. In the 1970s it became a notorious leather bar, with blacked-out windows, attracting an international crowd including the likes of Freddie Mercury, Kenny Everett, and Rudolf Nureyev. The pub underwent several different incarnations as a gay nightclub, the last as "Infinity", and after its closure, it was squatted, demolished and turned into yet another "local" outlet of a near-global grocery chain. The Pembroke pub, formerly the Coleherne, dates from the 1880s and had a long history of attracting a bohemian clientele before becoming known as a gay pub. A lifelong resident of Earl's Court Square, Jennifer Ware, recollects as a child being taken there to Sunday lunch in the 1930s, when drag entertainers performed after lunch had finished. It also became infamous as the stalking ground for three separate serial killers from the 1970s to the 1990s: Dennis Nilsen, Michael Lupo and Colin Ireland. It sought to lighten its image with a makeover in the mid-1990s to attract a wider clientele; to no avail, as in December 2008 it underwent a major refurbishment and repositioned itself as a gastro pub with a new name. Wikimedia Commons has media related to Earls Court. ^ Victoria County History of England, Middlesex, vol. I, 116-7. ^ Hermione Hobhouse, ed. (1986). 'The Edwardes estate: South of West Cromwell Road', in Survey of London. 42, Kensington Square To Earl's Court. London. pp. 300–321. [accessed 22 April 2019]. ^ Sir Nicholas Scott (Chelsea). "London Electronics College". House of Commons: Hansard vol 275 cc685-92 685 1.29 pm. Retrieved 24 April 2019. ^ "Pygmalion, His Majesty's Theatre, 1914, review of George Bernard Shaw's Pygmalion in London 100 years ago. Here is the original Telegraph review". Daily Telegraph. 19 April 2019. Retrieved 20 April 2019. ^ In the SW5 postal area alone, Polish outlets included: The Marine Officers' Club in Wetherby Gdns., the Airmen's Club in Collingham Gdns, The Displaced Polish Women's Hostel in Warwick Road (Dom Polek), two medical practices, Warwick Road and Penywern Road, three dental practices in Cresswell Gdns., Gledhow Gdns. and Wetherby Gdns., a pharmacy, Grabowski in Earl's Court Road (later the owner opened the Grabowski Gallery in Chelsea and funded a professorial chair at Cambridge University), three hotels: The Strathcona Hotel in Cromwell Road, the Lord Jim Hotel and the Oxford Hotel in Penywern Road, two booksellers and publishers: B. Świderski in Warwick Road, Orbis Books (London) in Kenway Road, three groceries: Chromiński and Kern's in Old Brompton Road, Ryszytny in Wallgrave Road and Finborough Road, two travel and parcel despatch companies: Haskoba in Cromwell Road, and Tazab Travel in Old Brompton Road, which later became a Polish-owned electrical shop and one undertaker: Łysakowski in Old Brompton Road, opp. Brompton Cemetery. ^ To the World's End: Scenes and Characters On a London Bus Route, director Jonathan Gili, BBC, 1985. ^ "History of Nevern Square,". Nevernsquaregarden.co.uk (23 July 2005). ^ Office for National Statistics Neighbourhood Statistics. ^ Dave Hill. "Earl's Court final curtain is sad reflection on Boris Johnson's London". The Guardian. ^ Colherne Court East in 1913 – 20th Century. Rbkc.gov.uk (20 April 2005). ^ "Syd Barrett, Wetherby Mansions, Earl's Court Square, Kensington, London". Notable Abodes. ^ "Syd Barrett in the bedroom of his Earl's Court flat, 1967". Pinterest. ^ UK | No takers for Diana's flat. BBC News (19 August 1998). ^ Princess Diana's Flat. Shadyoldlady.com. ^ Princess Diana – Gym – Earl's Court, west London Archived 31 May 2010 at the Wayback Machine. Prints.paphotos.com (21 August 1997). ^ "Celebrities mourn tragic death of socialite Tara Palmer-Tomkinson". 8 February 2017. Retrieved 12 February 2017. ^ "Tara Palmer-Tomkinson had not been seen for nearly a week before she was found dead, neighbours claim". Retrieved 12 February 2017. ^ Film locations for Repulsion (1965). Movie-locations.com. ^ "IMDb: Most Popular Titles With Location Matching "64 Coleherne Road, Earl's Court, London, England, UK"". IMDb. ^ Historic England. "Prince of Teck public house (1031501)". National Heritage List for England. Retrieved 19 December 2013. ^ "The Troubadour has been saved!". Evening Standard. Retrieved 24 January 2018. ^ h2g2 – The Earl's Court Police Box, London, UK. BBC. ^ . Royal Borough of Kensington and Chelsea. AA Illustrated Guide to Britain, Basingstoke, Hampshire, 5th edition, 1983, p. 240-1.